Atlantic senior editor David Frum argues how Trump's current administration is negatively affecting the US democracy and why this political decline needs to be interrupted. Frum has been writing sharp but sympathetic books on that land since his first, Dead Right, on the weaknesses of Reaganism, in 1994. The central theme in Frum’s excellent new book, Trumpocracy, which draws on his Atlantic articles, is what Trump’s career tells us about the deeper structural problems of America in general, and conservative America in particular ... Frum argues that Trump’s greatest talent — his genius really — is spotting and exploiting weaknesses ... What does Trump want to do with all his power? The answer, Frum argues, certainly does not lie in helping the white working class that put him in the White House ... It lies instead in 'the aggrandizement of one domineering man and his shamelessly grasping extended family.' The essence of Trumponomics is running a country just as you run your family business... But the bigger task is to eliminate the weaknesses that have produced Trumpism. Frum rightly points out that these are broad as well as deep. 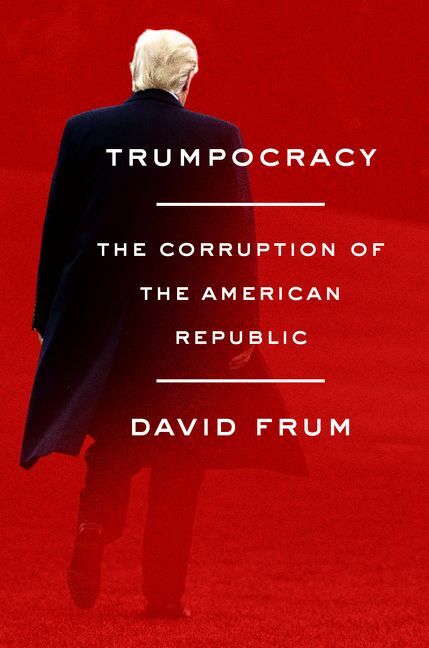 David Frum’s Trumpocracy is an attempt by the former speechwriter for George W Bush – author of the term 'axis of evil' – and never-Trump Republican to come to grips with this [Trump's chaotic executive power]. He laments what he views as 'the corruption of the American Republic' and painstakingly catalogs the threats he sees posed by Trump to America, liberal democracy and Europe ... Frum is not sanguine about a return to old norms in a post-Trump America ... At the same time, Frum confronts the disconnect between white working class voters and America’s elites... Yet it is over the very issues of class and the country’s red-blue divide that Frum appears to miss part of the picture ... The author is on stronger ground when he examines Russia’s role on the global stage, the 2016 election and the intellectual moorings of Trumpism. ...Frum purports to offer more than a rushed assessment of the last year. After all, he says, President Trump is not a cause but a symptom. Like another new book, Steven Levitsky and Daniel Ziblatt’s How Democracies Die, Trumpocracy is, in part, an exploration of the reasons for the president’s electoral upset and the roots of his rule ... Among Frum’s fellow Republicans who read this book, all but the most determined Trump enthusiasts should feel pin pricks of recognition and, depending on how much hypocrisy they can live with, a queasy discomfort ... The book seems to have been written in haste, a patchwork of bits and pieces from his Atlantic columns, additional examples of Trumpian malfeasance, and new ways of expressing old outrage ... Frum has the pamphleteer’s flair for the scathing epithet, which can be energizing or enervating, depending on your tolerance for hyperbole. Even sympathetic readers may feel besieged when he works himself up to full throttle. What did you think of Trumpocracy: The Corruption of the American Republic?